Anchorage, Alaska's largest city, has many personalities. 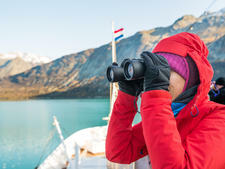 A cruise traveler's first impression is often of a cliched tourist destination with rows of souvenir shops selling chocolate moose poop, Alaska T-shirts and native ulu knives. But, duck down a side street, and it oozes a Pacific Northwest hipster vibe with galleries selling original paintings and organic silk-screened T-shirts, coffee shops serving up monster breakfasts and spicy hot chocolate, and brewpubs churning out growlers of locally produced beer. The city can even get a bit highbrow at the fabulous Anchorage Museum, where the state's artists team up with the veritable Smithsonian to display native Alaskan cultural artifacts and modern art as indecipherable as moose tracks after a heavy snow. When the rare sunny day comes along (and even when it doesn't), Anchorage puts on its outdoorsmen's hat. Nestled between the Chugach Mountains and the ocean, the city is ideally situated for outdoor play. On Flattop Mountain, blueberry-pickers, trail-runners, dog-walkers and even the occasional moose test themselves against the steep climb to the summit (or linger on the gentler, bottom slopes). In the city center, bikers, walkers and rollerbladers stretch their legs on the 11-mile Tony Knowles Coastal Trail that rims the city. You can't walk very far downtown without passing at least one bike rental place. And down at Ship Creek, not far from the port, fishermen attempt to catch their dinner in the form of big, meaty salmon. And, if Anchorage's multiple facets don't suit, the surrounding natural areas are available to anyone who doesn't mind spending a few hours on a bus, train or small plane. South of the city, Prince William Sound and the Kenai Fjords beckon with their dramatic glacial ice and variety of sea life. North of town, Talkeetna offers a glimpse into Denali National Park and the lofty Mt. Denali, especially if you can take to the skies. Wilderness hikes, salmon fishing and even bear watching are accessible in one very full day from Anchorage. 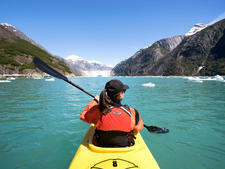 Cruise passengers visit Anchorage in a variety of ways. Some book extra time in the city before or after a cruise into or out of Seward or Whittier. Others overnight there as part of a cruisetour, a combination cruise-and-land tour. The Port of Anchorage is an industrial port located just a five minutes' drive from downtown Anchorage. 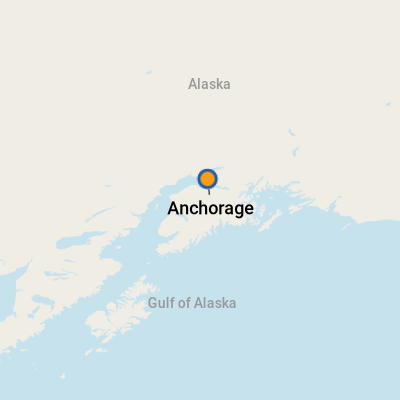 It is important to note that despite Anchorage being listed on many cruise itineraries (most people fly into the airport here), it is not a port of embarkation. 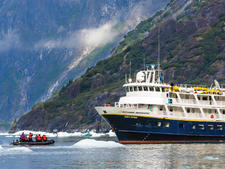 You're most likely to be in town before or after a cruise departing from the nearby port cities of Seward or Whittier. 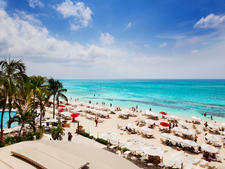 And by nearby, we mean about two hours' worth of driving, so plan transfers accordingly. Once or twice per season, a cruise ship will call on the Port of Anchorage, but this is an exception. The port does not offer a cruise terminal or any facilities, as it's mainly an industrial port with very little cruise ship traffic. 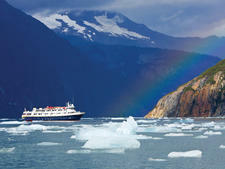 Holland America offers a free shuttle into town in conjunction with Visit Anchorage. It drops passengers off at the Egan Convention Center, where they can find bathrooms and ATMs; the center is within walking distance of all downtown attractions. Given that most goods and foodstuffs are flown or shipped into Alaska from the "Outside," you might be a bit taken aback by the higher-than-average costs of food and other essentials in Alaska. Then again, if you're from Manhattan, you won't bat an eyelash! On Foot: Anchorage's main downtown area is quite small and easily walkable. Most attractions are found between C and L Streets and 3rd and 8th Avenues. By Bus: You will see some public buses called People Movers, but they mostly head out to the university and the residential communities and aren't useful for tourists. Free shuttles run frequently throughout the day from the cruise ship terminal to the Egan Center in the heart of downtown; you don't need a car for most out-of-downtown attractions because so many places run (often free) shuttles. The Ulu Factory, Alaska Zoo and Alaska Wild Berry Park all offer free shuttles. Downtown Bike Rentals also runs a for-fee shuttle to Flattop Mountain for hikers and bikers. By Taxi: Taxis are available right at the port if you wish to head farther afield. Car rental agencies Avis (441 B Street) and Hertz (414 K Street) have locations a few blocks from the Egan Center; definitely make reservations in advance, as the small offices don't always have extra cars for rent. It's important to note that rideshare services like Uber and Lyft are not available in Alaska at the time of publication. Currency is the U.S. dollar. There are several ATMs and banks downtown, including First National Bank (646 W. 4th Avenue at G Street and 222 W. 7th Avenue at B Street) and Wells Fargo (in the 5th Avenue Mall). There's also an ATM in the Grizzly's Gifts store (501 W. 4th Avenue). Anchorage, like Alaska, is known for seafood: halibut, salmon, crab and razor clams. You won't find a ton of moose or bear on the menu, but reindeer sausage is popular. Look for the hot dog-style carts along the main streets. They're a favorite for a quick bite. Berries are also local, so look for them in pies or other dishes. Alaska has jumped on the microbrew trend, and Anchorage has several in-town brewpubs that serve up local beer and casual fare. Most restaurants will highlight Alaska brews on their beverage menus. A more expensive yet unique souvenir is a scarf, hat or headband made of qiviut, which is musk ox wool. It is warmer, softer and finer than lamb's wool. You can buy them at Oomingmak (604 H Street), but they're pricy -- items range from $100 on up.